Phoenix, Arizona is experiencing unmatched economic growth. With a burgeoning economy supporting solid business development comes a strong demand for signs, and a strong demand for signs requires a sign service firm ready for any job, any time. Trademark Visual is a turnkey sign company with a sign truck fleet made up exclusively of Elliott machines. Satisfaction with their Elliott HiReach fleet has kept them loyal to the brand, never having owned equipment from market competitors. Baum can’t say much in the way of comparing his Elliott machines to competitors. That’s because Trademark Visual has never used anything else. The technicians prefer working with Elliott machines to get jobs done quickly, safely and efficiently. 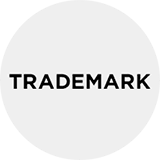 In doing so, Trademark stays on top of the growing Phoenix economy. G85 HiReach – As the flagship of Trademark’s fleet, the G85 HiReach includes a working height of 87 feet, a side reach of 61 feet and a 500-pound capacity for both its EZR removable platform and jib winch. It has a main winch capacity of 5,900 pounds and features DynaSmooth upper controls for precise aerial maneuverability. V60 HiReach – The V60 HiReach features a 63-foot working height and 38-foot working side reach with a top-mount platform and jib winch each rated to hold 500 pounds. The V60 fits on a 19,500 lb GVWR chassis, making it easy to drive and maneuver in urban areas. 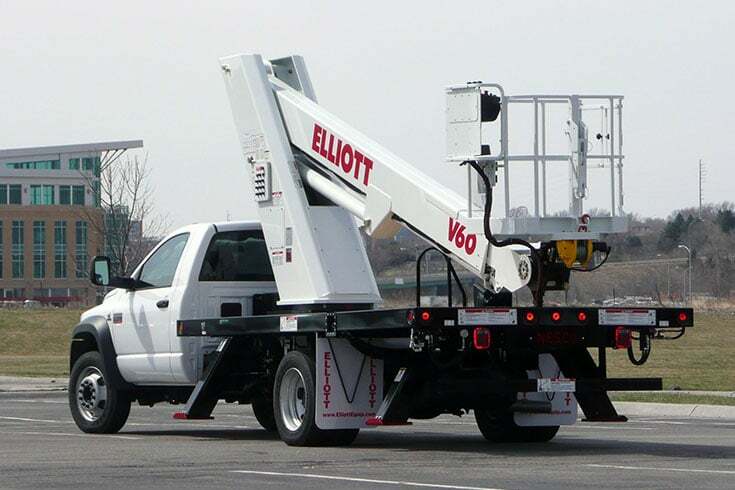 All Elliott machines come compatible with options and features designed specifically for the sign and lighting industry, including main boom material handling, oversized work platforms, jib winches, sign forks, and oxy-acetylene, pressure washing, and 110V power in the platform. 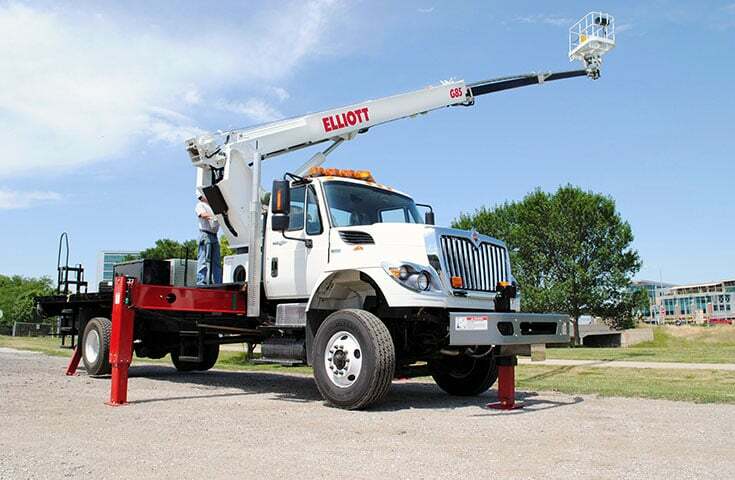 All Elliott HiReach units are backed by a lifetime structural warranty. CEO Michael Baum recalled the choice to operate an Elliott-only fleet, saying the decision was made after years of asking around in the industry and hearing the same thing: Machines manufactured by Elliott Equipment Company are stronger and more reliable than the competition. 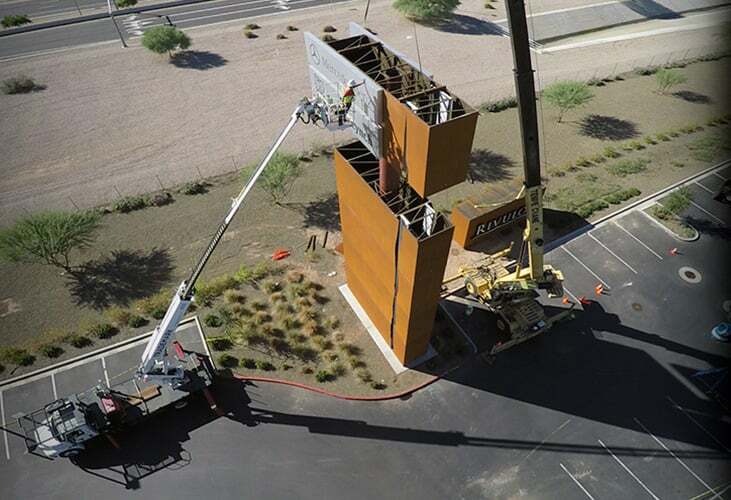 Baum said the sign business in the Phoenix area is competitive. “People want their signs when they want their signs.” Their fleet of Elliott machines allows Trademark to accept and complete any job that comes its way. The company is also less restricted in terms of personnel because the V60F HiReach features superior functionality for a variety of jobs without the need for a CDL license. At Elliott Equipment Company, we strive for unmatched quality with every machine we build. Companies like Trademark Visual prove that our heavy-duty, reliable equipment is up to the task for any job. See how firms in the sign and lighting industry use Elliott machines to enhance their business by downloading the industry brochure. If you’re ready to get an Elliott on your fleet, request a consultation or talk to your nearest distributor.